It’s difficult to get from Santiago to New Jersey. Nothing is direct (bus to Braga, bus to Porto, train to Lisbon, plane to U.S.) so I knew before I went to sleep that today was going to be a long day. 170+ miles of villages, drinking water out of fountains, and all it takes is one cafe in the big city to take me out. …although I laugh when I realize that, while I have my compostela in my left thigh pocket, the shape of my right one tells me I’ve still got my Brierley in it even though I wouldn’t be looking at it again. 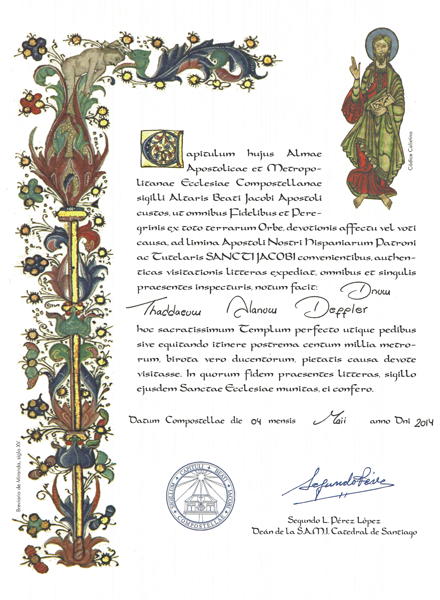 The Chapter of this Holy Apostolic Metropolitan Cathedral of St. James, custodian of the seal of St. James’ Altar, to all faithful and pilgrims who come from everywhere over the world as an act of devotion, under vow or promise to the Apostle’s Tomb, our Patron and Protector of Spain, witnesses in the sight of all who read this document, that: Mr Tad Alan Deffler has visited devoutly this Sacred Church in a religious sense. Witness whereof I hand this document over to him, authenticated by the seal of this Sacred Church. I woke up and realized I needed to change my plans. I needed another day in Santiago; I wanted to see Pilgrim’s Mass. Hearing “un Americano de Porto” (one American starting in Porto) listed in the roll call of pilgrims who had arrived in the last 24 hours made it all real. And then—to drive the nail home about how right it was to stay—they did the botafumeiro ceremony. 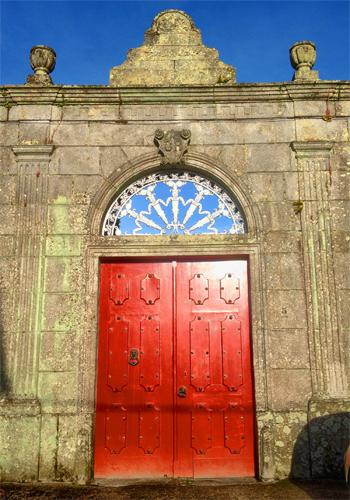 It’s very rarely done unless someone pays €350 to the church to do it but we got lucky. Picture a thurible over 5 feet tall, weighing about 175 pounds, being swung through a 200+ foot arc above the heads of the pilgrims, showering them with incense (to remove the vermin and odor the nasty pilgrims accumulated in their journey). It takes eight large men to hold onto it and keep it going. We had perfect seats at the end of the transept. The botafumeiro swings side to side in the cathedral so we could see the entire path. Those in the nave would have just seen a little blip going back and forth through their narrow field of vision. The video I took is far too big to post but here’s a 30 second excerpt showing it swinging. I spent the rest of the day off and on with Judy, Dirk, Ilona and Everita. We ate in the cafes and saw some more folks roll in. The others did some shopping. It felt good to be done and sad to be done. Most of all it felt peaceful. This is the day where I make up for lost time. A lot of the people we met were going only as far as the albergue in Teo or, perhaps, to find private accommodations around Conxho. The reason was to allow the last day’s walk to be short enough to make Pilgrim’s Mass in Santiago by noon. I couldn’t afford that time, so we were going to do the entire 25 km. It was all road walking today but the weather was nice, albeit a trifle hot. I loved seeing the unique Galician silos that kept the grain away from rodents. 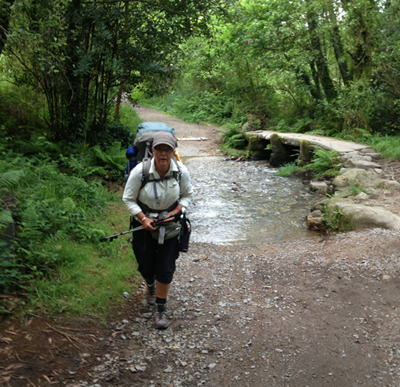 …and then the long final push into Santiago. My knee was acting up quite a bit and I had a difficult time the last few kilometers. You come out of the hills and have your first sight of the cathedral in the distance at almost exactly your elevation. Unfortunately, between those two points is a very steep dive down to the Sarela River over cobblestone and then an only-slightly-less-steep climb back up through the city streets. That morning I had debated sending my pack ahead to minimize the strain on the leg but, once I was standing in front of the cathedral, I was really glad I hadn’t given into the temptation. I would have felt like I cheated myself not to have walked in, pack and all. Thank heavens for trekking sticks though! Of course, the obligatory snapshot standing in front of Santiago Cathedral. 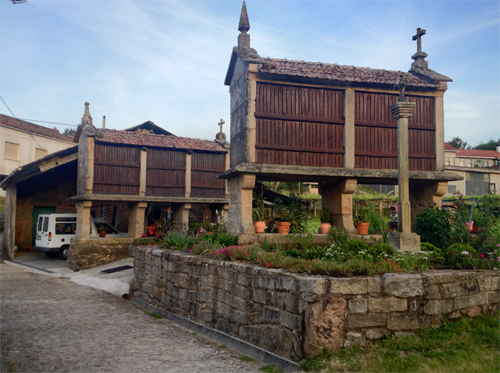 Then it was on to the Pilgrim’s Office to get our Compostela. There were maybe 30 people in line when we got there but they don’t hurry things inside, so that final 20 meters probably took longer to cross than the previous 3 kilometers of walking. It felt good to be there in a quiet sort of way. 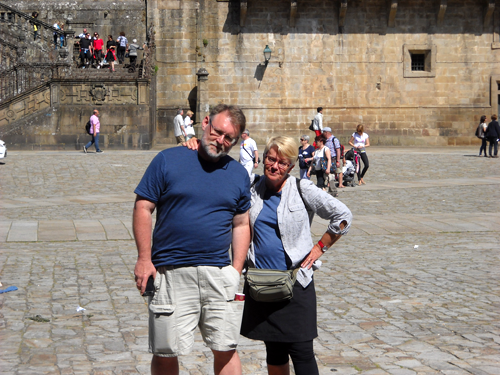 Having finished the Camino, we weren’t quite sure what to do. You’ve had this goal for so many days and then suddenly you’ve reached it and there’s this sense of, “Umm, now what?” So, we fell back on routine. We got a place to stay in the Seminary, each of us in a tiny little cell/room. Then we showered, washed out clothes (of course) and agreed to meet in the cafe on a square back to the right of the cathedral. We had dinner; we laughed and talked; we watched faces we recognized and didn’t recognize hike into town. Brazilian Guy walked by, as did Helmut and Josephine from Austria. The Finnish ladies were a couple of tables away, still looking sour. Ilona and Everita joined us for sangria. I was amazed at how many pilgrims there were. The Caminho Português comes into Santiago by a route all its own, diametrically opposite the cathedral from the Camino Frances. So, we literally were in our own little world of “almost no pilgrims” until we came out into the square. It felt good. My only regret was missing Pilgrim’s Mass even though I’m not religious, let alone Catholic. Today brought us to Padrón by cobblestone ways through small villages. The terrain was rolling hills and I was interested to see that burials in the villages weren’t below ground. Perhaps the soil was too rocky? I didn’t see this kind of thing at any other point in my trip. The legend of St. James says that he was the first of the apostles to be martyred, slain by King Herod Agrippa I in Judea. His remains were transported—either by angels or his devout followers, depending upon the version you hear—on a boat to his beloved Spain for burial. Padrón was the town where legend says that boat landed. 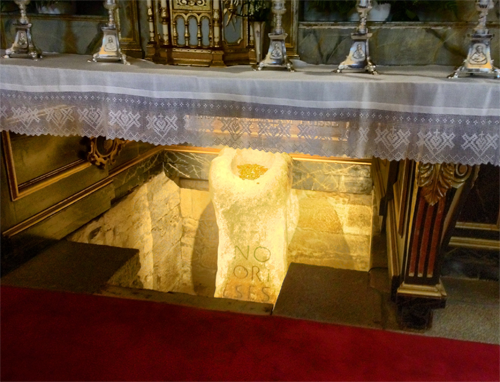 The rock where it was moored is enshrined in the Church of Santiago in Padrón underneath the altar. After two nights of school kids, Judy and I decided to avoid a third and stayed in a wonderful old townhouse that had been converted to a pension. I had twisted a knee that day and it was a bit swollen. I was looking forward to a good night’s sleep to let it heal, and €23 seemed a cheap price for that. While waiting for Judy to sign in, I sat down in obvious discomfort. This tiny, old woman, whom I took to be a maid, came bustling over and asked me something in Galician that I couldn’t understand. When I smiled and shook my head, she looked at me for a moment and then rushed away. Moments later she came back and motioned for me to push up the leg of my shorts. When I did, she proceeded to kneel down and rub this wonderful-smelling oil into my knee and quadriceps. There was rosemary and grape and other things I couldn’t identify. “For the pain,” the clerk translated. I later found out that the woman was the owner of the house and the oil mixture was a common folk remedy for sore muscles. Today was just another day of walking. If that sounds boring…it wasn’t. The morning was spent briefly along some wooded paths. The late morning and afternoon were spent on pavement. 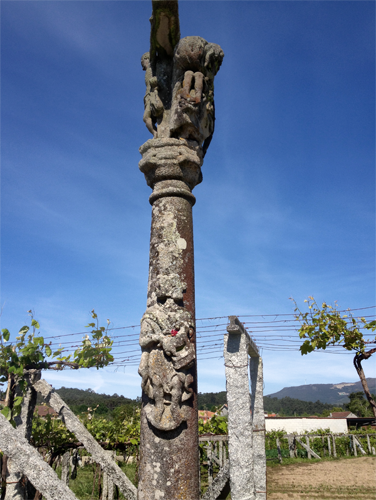 I noticed that the ubiquitous crucifixes alongside the road started to display a figure of St. James on the column, facing toward Santiago. We ended the day in Caldas de Reis. 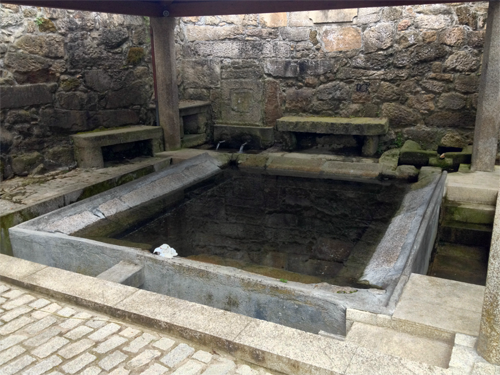 I had really meant to go visit the hot springs for which the town was named and soak my feet in the manner of pilgrims through the centuries. However, the one on the way into town was closed for that purpose and somehow it slipped my mind until far too late in the evening. I only remembered when Ilona and Everita, two women from Latvia whom we had encountered a few times, mentioned how wonderful it had felt. They were fast walkers and we never actually walked with them. However, we’d see them in each town and would spend a lot of time with them in Santiago. It was brutal in the albergue that night. They had too many beds for the size of the room, so your bunk would get shaken as people literally squeezed between them. There was a distinctive odor that bothered a lot of people although I eventually became numb to it. The albergue was overbooked, so mattresses were laid out in the tiny common area room and, coupled with gear everywhere—students didn’t quite get the concept of packs go under the bunk—people were tripping and stumbling all the time. Most of all, the students were noisy and restless (when they weren’t trying to arrange a bit of a make-out session behind makeshift screens of towels and blankets hung from bunks). We were definitely not well-rested when we started out the next day. Another day of walking…of course! Early morning found us on paths up in the hills, sometimes above the cloud layer, as you can see in the distance. The very early start put us into the spa town of Arcade quite early in the morning. The raking light from the sun made for great scenery, both of the picturesque bridge in and the houses once inside. Afternoon took us out of the woods and onto the pavement again. 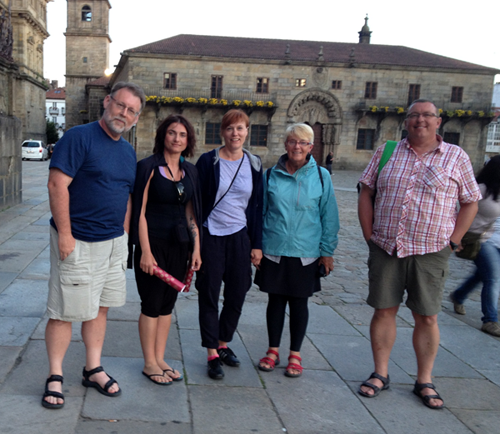 Despite the encouraging monuments to pilgrims, we’d be footsore once we arrived in Pontevedra. Unfortunately, once we arrived there, we found that May 1st is quite the holiday weekend and many school groups walk the Camino. We’d have 30+ noisy teenagers with us for the next few days. I said a couple days back that I felt everyone walked their own Camino. 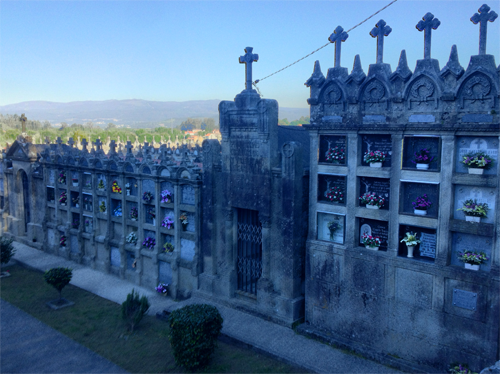 I have to admit that, at Pontevedra, that belief got shaken a bit. We’d see these vans of well-dressed tourists pull up to a corner. They’d all get out, walk up a block to a cafe or tourist office, get a sello on their credencial, then head back to the van and drive off. I have to admit that all intentions of being open-minded fled as I thought, “Cheaters!” After all the years of seeing pilgrims, I bet the shopkeepers weren’t fooled at all by the van being out of sight and probably just smiled cynically as they stamped. Sometime this morning I realized that walking had become a habit. I no longer thought about it unless my feet were hurting badly. I never even noticed my backpack. Get up early, close up the pack and set out, eating a pastry bought the day before on the way. Talk with Judy for a while and then gradually separate and walk alone for an hour or two. Meet up at a rest stop where we ate the bread, cheese and fruit in our packs. I’d have water; Judy would have her beloved chocolate milk; Dirk would consume the first of two Cokes he brought. Walk alone or together until near our destination, then walk into town together. Shower, wash and hang clothes, eat and then spend the evening talking with whomever we met in the albergue. Before the trip, this would have seemed monotonous. In reality, it was simple and very refreshing. 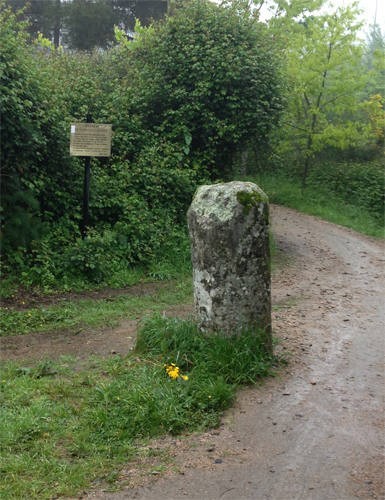 Today had us walking along the path and remains of Via XIX, one of the old Roman roads through Galicia connecting Braga with Astorga via Lugo. It was exciting to come to a corner of a path in the woods and find a miliario—a Roman marker originally set every 1480 meters—standing there “out in the wild.” Most of these 2-ton columns are long gone. Others have been moved into museums, leaving behind a plague or a modern replica. But not all and we’d come across stones that were erected just over 2000 years ago still standing out in the middle of nowhere. 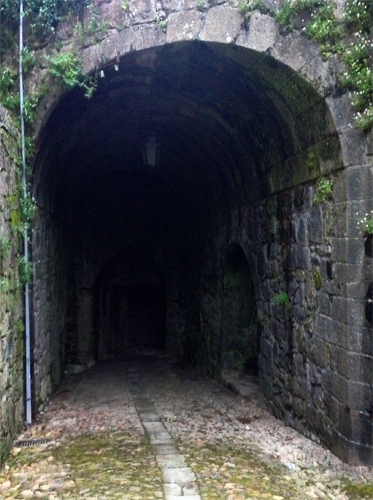 We got to Redondela before the albergue—a fully restored tower house from the middle ages—was open. While waiting, Kara from Netherlands stopped by. She was going to push on a little further. We had met her the night before and found out that she had started from the Lisbon area and had walked up by herself, camping in fields and living on the generosity of villagers. I wouldn’t have wanted to carry her pack; it weighed around 15 kilos. She was obviously quite fit but did admit it had become too heavy, especially since her feet were blistered from walking in unbroken-in boots. Dirk and Judy headed off to find a cafe with WiFi (I still chuckle at the “weefee” pronunciation). He liked to Skype his wife every day and Judy like to update the Facebook page she used to keep her family up-to-date on her journey. Even though it was raining, I just enjoyed sitting on the square and watching the people. With my feet tucked under the bench to keep my boots dry, my rain jacket keeping my body dry and my Akubra keeping my head dry, I was warm enough; what’s not to like? I had wondered whether bringing that hat was mistake because it wouldn’t fold up. There were a couple times when I wasn’t wearing it and the wind came up that it was an annoyance. I had started out slinging it on the back of my pack but that was too hard to reach, so I put a carabiner on the chest strap of my pack that would hook the hat’s stampede strap. I could just pull the hat off and drop it and it would sit nicely against my chest…except when the wind slapped it around and I had to hold it. Still, it was good as a sun hat and, when it poured, it really came into its own. My head, neck and face would be bone dry while the brims of Tilley hats were collapsing from the deluge and those wearing rain jacket hoods kept saying, “What? I can’t hear you,” and complaining of no peripheral vision. Plus, hung from the underside of the top bunk, I had a perfect place for glasses and wallet at night. Once out of the fortress it was a quick walk down through the town to the bridge to Tui. 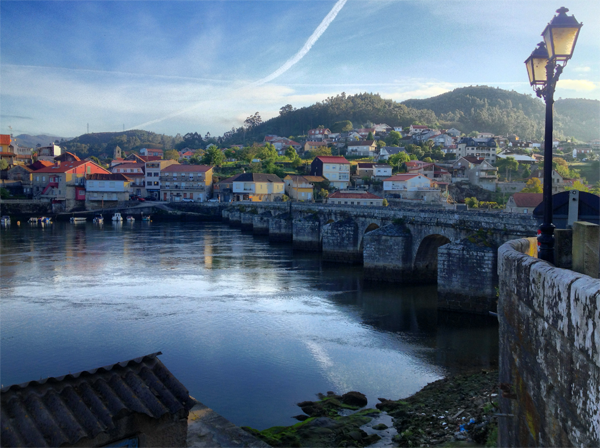 Halfway across, the Rio Minho became the Rio Miño…and bom caminho became buen camino or, more properly, bo camiño as they speak Galician in preference to Castilian Spanish in these parts. Apparently, the previous evening was a party night as I had more than one encounter with a group of inebriated fellows insisting that I give them cigarettes. It seemed to baffle them that I didn’t smoke. Aside from them, Tui looked like a fascinating town. I could see why Marcia wanted to take a rest day here. I was particularly struck by the communal laundry areas. Later in the trip, I saw one with women gathered around, scrubbing their clothes on the slanted stones. However, despite the appeal of a look around, I felt I needed to keep moving. For some reason, it seemed important to get back to walking and take my mind off the fact that I was, once again, walking alone. I basically had to make a choice between making up my day by pushing all the way to Redondela (32-ish kilometers) or doing it later in the trip. Since the first 17 km were going to be a long, hard slog on pavement through industrial areas (or so I thought) I chose the latter. I’d stay in Porriño and move on to Redondela the next day. Making up for lost time could occur at the end. However, to my pleasant surprise, a Friends of the Camino group had built a number of detours around some of that industrial area. The detours added 5+ kms to the trip, but allowed me to walk through forest paths and alongside small streams. Not everyone was happy about the detours, though. 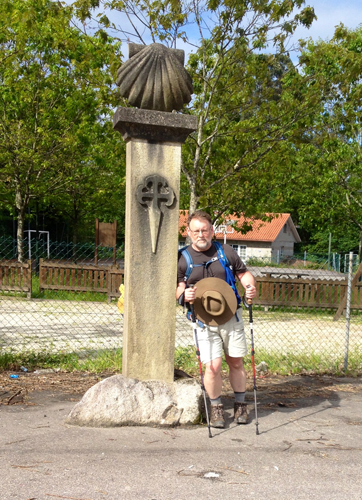 There were a number of false waymarks directing pilgrims off the track, particularly around Orbenlle. Supposedly, merchants bypassed by the detour were trying to get pilgrims connected back to the original route. We had been warned about these and I didn’t get taken in by any of the false ones. However, early in the day I did think that a real waymark done with an unusual shade of paint was a fake one and ended up taking a wrong path for quite a ways. By the time I realized my mistake, I was high on a railroad bridge looking down at the real path below. Rather than backtrack, a fellow pilgrim and I tossed our packs over the fence, scaled up and over, and then slid down through the nettles and pricker bushes to rejoin the way. A few scratches didn’t detract from an otherwise nice day. And, in fact, the good things weren’t over. 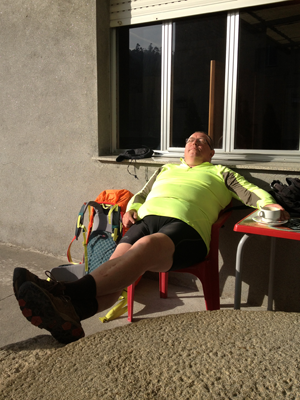 Literally at the door of the excellent albergue in Porriño I ran into Dirk from Belgium. 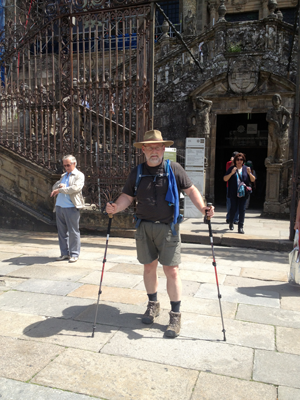 We had see each other off and on but he, too, was walking alone, having left his previous companion, Jürgen Lazarus (what a surname for an 80 year old man walking the camino! ), from Germany behind. And then, about an hour later, I hear, “Shhh! Shhh! Don’t say anything,” and Dirk starts laughing. Peering around to see what was going on, I was stunned. There’s Judy! The trio that would walk into Santiago together was set. Great day, indeed!